Following the success of the 1st WIEF Web-Reach Internet Marketing Workshop in Kuala Lumpur in February 2012 and the 1stRegional WIEF Web-Reach Internet Marketing Workshop in Nairobi, Kenya in October 2012, the WIEF Businesswomen Network (WBN) organised the 2nd Regional WIEF Online Marketing Workshop on 8 – 12 April 2013 in Surabaya, Indonesia. Aimed at providing a networking berth for women entrepreneurs and enhancing the economic wellbeing of Muslim communities around the world, the 2nd WIEF Regional Online Marketing Workshop provided an excellent tool to harness the power of internet marketing and to connect their businesses to the World Wide Web. “This Workshop is a testament to our dedication in elevating the entrepreneurial development of businesswomen. In today’s business practices, online presence and internet marketing plays a pivotal role in the growth and sustenance of many enterprise. It gives me immense pleasure and satisfaction to see 50 women entrepreneurs utilising the Workshop’s hands-on practical training on online marketing strategies and techniques to excel in their respective businesses”, said WIEF Foundation Chairman, The Hon. Tun Musa Hitam during the Closing Ceremony of the Workshop at Somerset Hotel Surabaya. “The tides are turning in favour of women in developing countries. Women are pushing the boundaries of their traditional roles while supporting their families, creating jobs and contributing to the waves of innovation emerging from the least likely of places. Women entrepreneurs—with their natural instincts for commerce—undoubtedly recognise the enormous potential of creating voice and presence online,” explained WBN Chairman Dato’ Dr. Norraesah Mohamad. The Closing Ceremony Dinner was attended by Yth, H. Saifullah Yusuf, Vice Governor, Jawa Timur, Indonesia. The evening started with a representative of the participants sharing her experience with the invited guests. 50 websites created during the Workshop were showcased during the Ceremony and the 5 most creative and innovative websites were adjudged winners of the Workshop. All participants received their Certificate of Completion at the Ceremony. The participants were carefully selected from a range of industries to create a dynamic business networking environment such as frozen food, Muslim apparel fashion, bakery, travel agency, management consultancy, etc from Surabaya, Bali and Bandung. “Businesswomen in developing countries are becoming more competitive than ever. This is exactly the kind of workshop needed by these entrepreneurs to help enhance their marketing skills. Women entrepreneurs have a significant role in driving economic growth especially in Indonesia as the private sector is on the rise. I appreciate the effort of the WIEF Foundation in bringing the workshop to benefit women entrepreneurs here in Surabaya”, said Yth Bpk Tanri Abeng, Member of the WIEF International Advisory Panel. Yth Ibu Rina Fahmi, Chairman of Indonesian Business Women Association said, “Lately, interest in women entrepreneurship has increased significantly among policy makers, academics and practitioners in Indonesia. 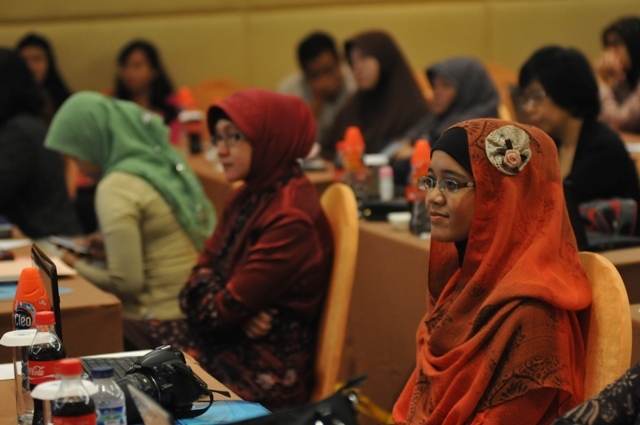 IWAPI has been organising many training programmes to produce more women entrepreneurs especially in the two major cities in Indonesia – Jakarta and Surabaya. I believe this Workshop will greatly benefit these aspiring businesswomen by taking their respective ventures to e-commerce and online marketing”. The five-day intensive Workshop was inaugurated on the 8th of April by Mr. La Nyalla Mahmud Mattalitti, Chairman of East Java Chamber of Commerce and Industry. “Hopefully this programme can be valuable to improve the capability and capacity for the participants to compete internationally by leveraging technology in a positive way.” said Mr. Mattalitti. The trainers of the Workshop provided hands-on training to participants on several key modules including Content Management System (CMS), Search Engine Optimisation (SEO), Knowledge Sharing & Viral Marketing Strategies, Photo & Video Marketing, Online Monitoring tools and Social Media Marketing on Facebook and Twitter. The successful 2nd Regional WIEF Online Marketing Workshop was organised by the WIEF Businesswomen Network (WBN) in collaboration with the Indonesian Business Women Association and the East Java Chamber of Commerce and Industry, with the support of The Coca-Cola Company as the Strategic Partner. Since its inception, WBN has launched a series of initiatives designed to provide networking platforms for both aspiring and experienced women entrepreneurs through business programmes such as the WIEF Annual Businesswomen Forum, WBN Women Entrepreneurs Workshop, and the recent WIEF Web-reach Internet Marketing Workshop.